Flame Wall is a fire-based attack used by fire-type monsters and some bosses in Super Mario RPG: Legend of the Seven Stars, such as Mack and Czar Dragon. The attack deals medium damage to all members of Mario's party. The animation for Flame Wall is a roaring fire sound and a reddish-yellow wave of fire that moves diagonally across the screen. 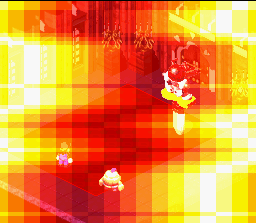 In the Virtual Console version of Super Mario RPG: Legend of the Seven Stars, the Flame Wall animation is not as bright, with only small shades of red and no yellow. This change was likely done to prevent seizures. ↑ Virtual Console. Super Mario RPG Secrets. Retrieved March 5, 2019. This page was last edited on March 5, 2019, at 17:30.